Nuclear Blue Grasshopper Jello* is a delicious chocolate-mint gelatin dessert made with Crème de Menthe and Crème de Cacao (which are the major ingredients of the Grasshopper, naturally). 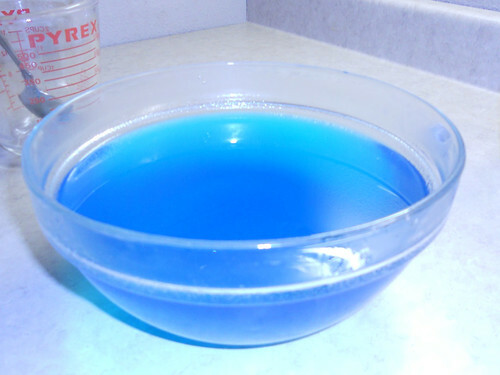 I've been bringing Nuclear Blue Grasshopper Jello to Thanksgiving Dinner for many years. I'm known for it. I've usually just make it in a flat dish and cut it into squares, but this year, I wanted to do something more interesting. When my sister said she didn't have a jello mold, but she did have a form for making Delightful Sea Creatures, I knew what must be done. 1. 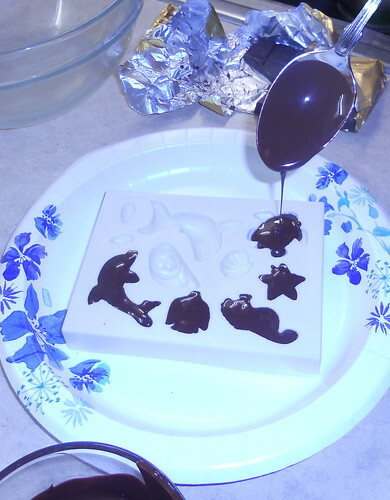 Break chocolate into pieces and heat until nearly melted (I used a microwave, but one could probably use a double-boiler). Stir until all lumps melt. 2. Spoon chocolate into mold. 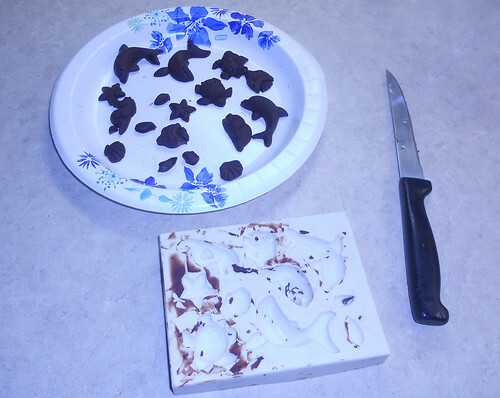 Pro Tip: While you can overfill the mold and clean away the extra after the chocolate has set, you'll get better results if you carefully fill to the edges, as shown. 3. Cool chocolate. I put it in the freezer, so it would be more stable when it goes into the warm jello. 4. Repeat until you have as many chocolates as you think you'll need. 5. When all of your Delightful Sea Creatures have been made, pour 2 cups of your liqueurs into your bowl, and sprinkle gelatin on the surface. Let dissolve. 6. Heat the other 2 cups of liqueurs in microwave until hot (does not need to boil). 7. 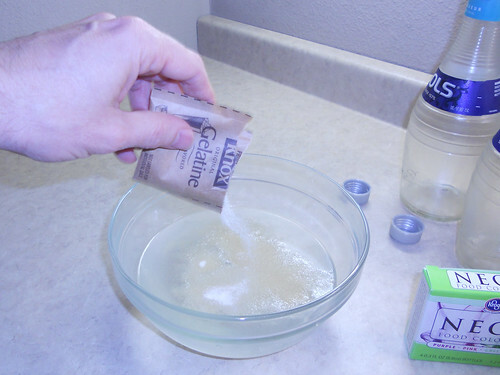 Pour into gelatin mixture, and stir until blended. Gelatin may appear slightly grainy and opaque, but there shouldn't be any lumps. 8. 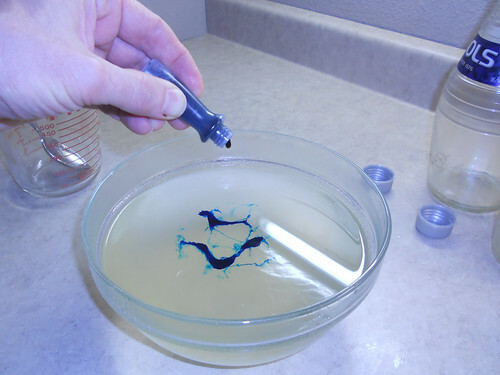 Add drops of food coloring, to taste. Watch the streamers of color swirl around as you stir. It's pretty cool. 9. 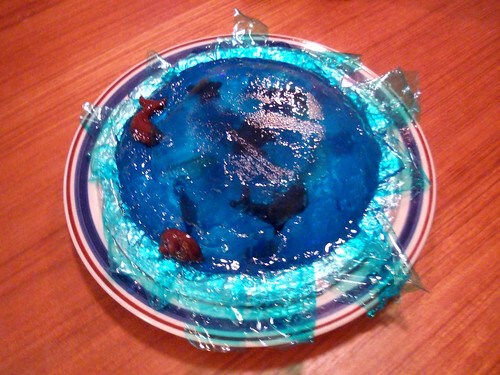 Eventually, your jello will be a uniform awesome blue. Admire. Optional: If you're using a mold, pour jello mixture into it now. 11. While jello is cooling, remove the last of the chocolates from the mold, and trim off any excess. 12. When jello is cool but not yet solidifying, select some of the chocolates and drop them top-down into the jello. 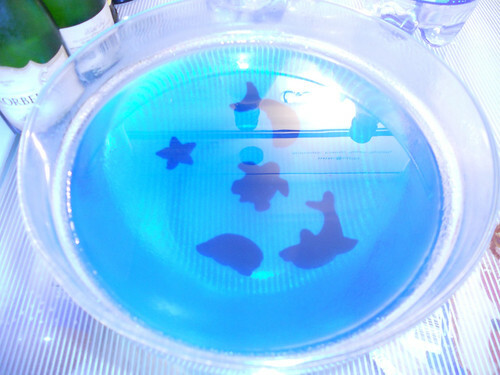 They'll sink to the bottom, and become the surface creatures when the jello is removed from the bowl or mold. 13. When jello is chilled enough to be viscous, but not fully set, gently insert some Delightful Sea Creatures into the middle section. Put the rest top-down on the surface. They'll become the benthic layer. 14. Allow to cool thoroughly. Jello will set up to finger-jello consistency. 15. To serve, set the bowl or mold in warm water until the jello releases from the form. Put serving plate upside-down on bowl/mold, and turn everything over. If all goes well, the jello will come to rest on the serving plate in one piece. I served it on a bed of strips of "seaweed," which were strips of green Saran Wrap arranged on a plate. The end result wasn't as structurally solid as it usually is; I might have needed to heat the hot liquid more. The flavor and potency were good, and the sea creatures came out pretty well, so overall it was a win. I used a high-percentage-cacao dark chocolate, figuring that it needed to be a strong flavor to stand up to the liqueurs. I also considered white chocolate with food coloring to make colorful Delightful Sea Creatures. Experiment as you see fit. If full-strength liqueurs are overwhelming to your palate, substitute water for part of the liqueur mix, to taste. 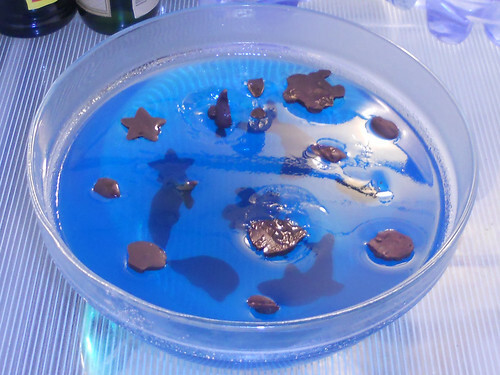 Delightful Sea Creature Nuclear Blue Grasshopper Jello will be highly attractive to children and they'll very much want to eat the pretty jello with Delightful Sea Creatures, but it does contain a fair bit of alcohol and you should be prepared to prevent them from eating it, explain WHY you're not letting them eat it, and perhaps have a non-alcoholic version available to cut down on the whining. 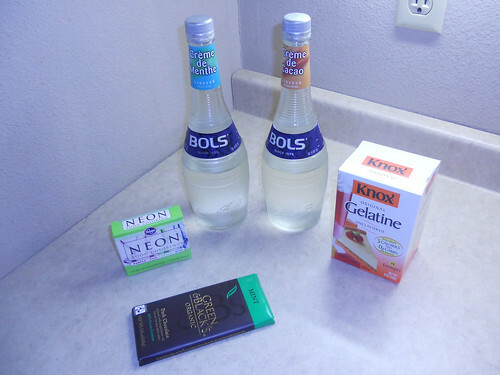 * While Jell-O® is a registered trademark of Kraft Foods, All uses of "jello" here mean "generic gelatin-based dessert," not the registered product. Just so you know.